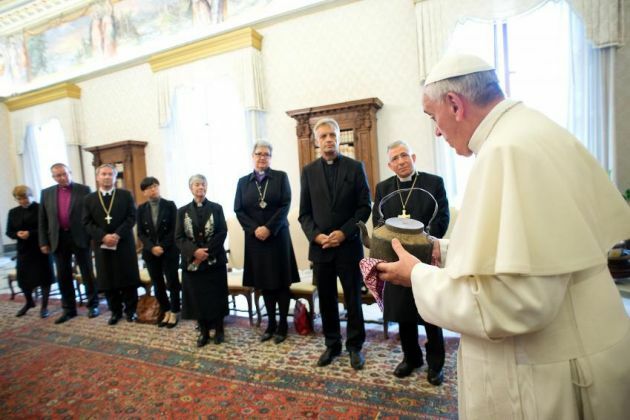 (Photo: Osservatore Romanot)Pope Francis received a refugee's teapot as an invitation to work together for the suffering neighbor when he met a group from the Lutheran World Federation in 2013. WORKING TRANSLATION PROVIDEd BY "LA CIVILTÀ CATTOLICA"
During a meeting of the editors of the European cultural journals of the Society of Jesus, in mid-June, I expressed to Fr. Antonio Spadaro, editor of La Civiltà Cattolica, a desire that I had in my heart at the time: to interview Pope Francis on the eve of his Apostolic Trip to Sweden, October 31, 2016, to participate in the ecumenical commemoration of the 500 years of the Lutheran Reformation. I thought that an interview was the better way to prepare the country for the message that the Pope would address to the people during his visit. As director of the Swedish cultural journal of the Jesuits, Signum, I thought this goal rightfully dovetailed with our mission. great concern to the Pope. He has expressed it in many ways. But above all, he himself is a man of reconciliation. Francis is deeply convinced that men and women must overcome barriers and fences, of any kind. He believes in what he defines as the "culture of encounter". And this so that all can cooperate in the common good of humanity. I wanted this vision of Francis to touch minds and hearts before the Pope's arrival in Sweden. The interview would be the best means to reach such an objective. I said this to Fr. Spadaro, with whom I continued to reflect until August, when together we arrived at the conclusion that it would be truly opportune to present this request to the Pope in a way that he could decide whether or not to fulfill it. The Pope took time to reflect on his opportunity. At the end, the answer was positive and he gave us an appointment at Santa Marta, Saturday, September 24, 2016, in the late afternoon. of the sky. Going through the Roman traffic in a car with Fr. Spadaro, I felt anxious, but content. We arrived 15 minutes before the expected time. We expected to wait, and instead we were immediately invited to go up to the floor where the Pope has his room. When the elevator opened, I saw a Swiss Guard who greeted us courteously. I heard the Pope's voice talking cordially with other people in Spanish, but I did not see him. At a certain point, he appeared with two people, conversing amiably. He greeted me and Fr. Spadaro with a smile, indicating to us to go into his room. He would come in a moment. at the reception desk that the Pope had had a non-stop day and I, therefore, thought he would be tired. Instead, I was very surprised to see him so full of energy and relaxed. the two chairs. I wanted to introduce myself in my Italian, which is limited but sufficient to understand and dialogue with him. After some banter with the Pope, we turned the recorders on and started the conversation. Fr. Spadaro had translated some questions from English that I would like to ask the Pope and that he then had prepared, but then the conversation between the three of us flowed naturally, in a friendly atmosphere and without artificial distances. Above all, it was forthright and direct, straightforward and without that atmosphere typical of encounters with great leaders or dignitaries. I no longer have any doubt of the fact that Pope Francis loves conversation, communicating with others. Occasionally he took time to reflect before answering, and his answers always conveyed a sense of serious involvement, but not ponderous or sad. On the contrary, during our visit several times he gave us signs of his humor. Holy Father, on October 31st you will visit Lund and Malmö to participate in the ecumenical Commemoration of the 500 years of the Reformation, organized by the Lutheran World Federation and the Pontifical Council for the Promotion of Christian Unity. What are your hopes and expectations for this historic event? I can think of only one word to say: to come close. My hope and expectation is that of coming closer to my brothers and sisters. Closeness does all of us good. Distance, on the other hand, makes us bitter. When we are distant, we close within ourselves and we become individual entities, incapable of encountering each other. We are held back by fears. We need to learn to transcend ourselves to encounter others. If we do not do this, we Christians, too, become sick because of our divisions. My expectation is that of being able to take a step of closeness, of being closer to my brothers and sisters in Sweden. In Argentina, the Lutherans make up a rather restricted community. Have you had the opportunity to make direct contact with them in the past? became an auxiliary bishop of Buenos Aires. One day, the then-Archbishop Primate of Uppsala came to visit me in the bishop's residence. Cardinal Quarracino was not there. He invited me to their liturgy in the calle Azopardo, in the Iglesia Nórdica of Buenos Aires, formerly called the "Swedish Church". I spoke to him about Anders Ruuth, who had returned again to Argentina to celebrate a wedding. We met on that occasion but it was the last time: one of his sons, the musician—the other one was a doctor—called me one day to say that his father was dead. Denmark. I had a good relationship with the pastor at the time, Albert Andersen, who is now in the United States. He invited me twice to give a sermon. The first was in a liturgical context. On that occasion, it was very delicate. To avoid creating embarrassment about participation in Communion, the liturgy was not celebrated, but a Baptism. Later he invited me to hold a conference for their youth. I remember that I had a very strong discussion with him long distance when he was already in the United States. The pastor had chided me a lot because of what I had said about a law concerning religious issues in Argentina. But I must say that he chided me honestly and sincerely, as a true friend. When he returned to Buenos Aires I went to apologize because, in fact, the way I had expressed myself had been a bit offensive. Then I had a great closeness with Pastor David Calvo, an Argentinian, of the Iglesia Evangélica Luterana Unida. He also was a good man. I also remember that for the "Day of the Bible", which is celebrated in Buenos Aires at the end of September, I returned to the first church which I had visited as a young man, in calle Esmeralda. And there I encountered Mercedes Garcia Bachmann. We held a conversation. That was the last institutional encounter I had with Lutherans while I was archbishop of Buenos Aires. Since then I have continued to have relationships with individual Lutherans on a personal level. But the man who did so much good in my life was Anders Ruuth. I think of him with so much affection and gratitude. When the Archbishop Primate of the Church of Sweden came here to see me we made a reference to that friendship between the two of us. I remember well when Archbishop Antje Jackelén came here to the Vatican in May 2015 on an official visit. She gave a very nice speech. I met her later also on the occasion of the canonization of Elizabeth Hesselblad. Then I was also able to greet her husband. They are truly pleasant people. Then as pope, I went to preach in the Lutheran Church of Rome. I was very impressed with the questions that they asked then: that of the child and that of the woman on intercommunion. Beautiful and profound questions. And the pastor of that church is really good! In ecumenical dialogue, the different communities should be mutually enriched with the best of their traditions. What could the Catholic Church learn from the Lutheran tradition? reformanda (always reforming). The second word is "Scripture", the Word of God. Luther took a great step by putting the Word of God into the hands of the people. Reform and Scripture are two things that we can deepen by looking at the Lutheran tradition. The General Congregations before the Conclave comes to mind and how the request for a reform was alive in our discussions. Only once before has a pope visited Sweden and that was John Paul II in in 1989. That was a time of ecumenical enthusiasm and of a profound desire for unity between Catholics and Lutherans. Since then the ecumenical movement seems to have lost vigor and new obstacles have arisen. How should these obstacles be handled? What are, in your opinion, the best means to promote unity among Christians? Continuing to dialogue and to study the issues clearly belongs to the theologians. On this there is no doubt. Theological dialogue must continue, because it is a path to follow. I think about the results that were achieved on this path with the great ecumenical document on justification. It was a great step forward. Certainly, after this step I imagine it will not be easy to go forward because of the different ways of understanding some theological questions. I have asked Patriarch Bartholomew if what was told about Patriarch Athenagoras was true, what he said to Paul VI: "Let the two of us go ahead and we will put the theologians on an island to discuss among themselves". He told me that it was a true remark. But, yes, theological dialogue must continue, even if it will not be easy. Personally, I believe that enthusiasm must shift towards common prayer and the works of mercy -- work done together to help the sick, the poor, and the imprisoned. To do something together is a high and effective form of dialogue. I also think about education. It is important to work together and not in a sectarian way. There is a policy we should have clear in every case: to proselytize in the ecclesial field is a sin. Benedict XVI told us that the Church does not grow by proselytism, but by attraction. Proselytism is a sinful attitude. It would be like transforming the Church into an organization. Speaking, praying, working together: this is the path that we must take. Look, in ecumenism the one who never makes a mistake is the enemy, the devil. When Christians are persecuted and murdered, they are chosen because they are Christians, not because they are Lutherans, Calvinists, Anglicans, Catholics or Orthodox. An ecumenism of blood exists. I remember an episode that I experienced with the parish priest from the parish of Sankt Joseph at Wandsbek, Hamburg. He brought forward the cause of the martyrs guillotined by Hitler because they taught the catechism. They were guillotined one after the other. After the first two, who were Catholics, a Lutheran pastor condemned for the same reason was murdered. The blood of the three was mixed. The parish priest told me that it was impossible for him to continue the cause of the two Catholics without including the Lutheran. Their blood was mixed! But I also recalled Pope Paul VI's homily in Uganda in 1964, that mentioned unity, Catholic and Anglican martyrs together. I had this thought when I, too, visited Uganda. This also happens in our day: the Orthodox, the Coptic martyrs murdered in Libya... It is ecumenism of blood. So: praying together, working together and understanding ecumenism of blood. One of the major causes of restlessness in our time is the spread of terrorism clad in religious terms. The encounter at Assisi placed the accent on interreligious dialogue. How did you experience it? All the religions were there who had contact with Sant'Egidio. I encountered those who Sant'Egidio contacted. But there were so many, and the encounter was very respectful and without syncretism. All of us talked of peace and we asked for peace. We together said strong words for peace, what the religions truly want. You cannot make war in the name of religion, in the name of God. It is blasphemy, it is satanic. Today I received about 400 people who were at Nice, and I greeted the victims, the wounded, people who have lost wives or husbands or children. That madman who committed that massacre did so believing he did it in God's name. Poor man, he was deranged! Charitably we can say that he was a deranged man who sought to use a justification in the name of God. This is why the encounter at Assisi is very important. But you have recently talked about another form of terrorism, that of gossip. In what sense and how do you overcome it? Yes, there is an internal and underground terrorism that is bad habit to root out. I describe the bad habit of murmurings and gossip as a form of terrorism. It is a form of deep violence that we all have available in our soul and it requires a profound conversion. The problem with this terrorism is that we can all implement it. Every person is capable of becoming a terrorist simply by using the tongue. I don't speak of the quarrels that are done openly, like wars. I speak about a sneaky terrorism that you do by throwing words like "bombs" and that do a lot of evil. The root of this terrorism is original sin and it is a form of crime. It is a way to gain space for yourself by destroying the other. A deep conversion of the heart is necessary, then, to overcome this temptation, and we need to examine ourselves a lot on this point. The sword kills so many people, but the tongue kills more, the Apostle James says in the third chapter of his Letter. The tongue is a small member, but it can develop a fire of evil and burn all our life. The tongue can be filled with deadly poison. This terrorism is difficult to subdue. Religions can be a blessing, but also a curse. The media often report news of conflicts between religious groups in the world. Some state that the world would be more peaceful if there were no religions. How do you respond to this criticism? transcendence then absolutely cannot be a cause of terrorism, because this opening is always united to the search for truth, beauty, goodness and unity. You have spoken often in very clear terms of the terrible situations of the Christians of the Middle East. Is there still hope for a more peaceful and human development for the Christians in that area? I believe that the Lord does not leave his people on their own. He will not abandon them. When we read of the hard trials of the people of Israel in the Bible or remember the trials of the martyrs, we see how the Lord always comes to the aid of his people. We recall in the Old Testament the murder of the seven brothers with their mother in the Book of Maccabees. Or the martyrdom of Eleazar. Certainly martyrdom is one of the forms of Christian life. We recall St Polycarp and the letter to the Church of Smyrna that gives us the story of the circumstances of his arrest and death. Yes, in this moment the Middle East is a land of martyrs. We can without doubt speak of a Syrian martyr and martyrdom. I want to cite a personal memory that remains in my heart. At Lesbos, I met a father with two children. He told me that he was very in love with his wife. He is Muslim and she was Christian. When the terrorists came, they wanted her to take of her cross, but she did not want to do it and they slit her throat in front of her husband and children. He continued to say: "I love her so much, I love her so much". Yes, she is a martyr. But the Christian knows that there is hope. The blood of the martyrs is the seed of the Christians. We have always known it. You are the first non-European pope for more than 1,200 years at this point, and have often highlighted the life of the Church considered "peripheral" in the world. Where, according to you, will the Catholic Church have its more lively communities in the next 20 years? And in what way will the European Church be able to contribute to the Catholicism of the future? of the moment for the Church, the challenge to its capacity for freshness. This is why at Krakow during World Youth Day, I recommended to the young people to speak with their grandparents. The young Church rejuvenates more when the young people talk with the elderly and when the elderly know to dream great things, because this ensures they prophesy. If the young don't prophesy, the Church lacks air. Your visit in Sweden will touch one of the most secularized counties of the world. A good part of its population does not believe in God, and religion plays a fairly modest role in public life and society. According to you, what does a person lose who doesn't believe in God? It is not losing something, but is about not adequately developing a capacity for transcendence. The path of transcendence gives place to God, and in this the little steps are even important, even that of being an atheist to being an agnostic. The problem for me is when one is closed and one considers their life perfect in itself, then one closes in on oneself without the need for a radical transcendence. But to open others to transcendence there's no need to use so many words and discourses. Whoever lives transcendence is visible. He or she is a living witness. In the lunch that I had at Krakow with some young people, one of them asked me: "What must I say to my friend who does not believe in God? How do I convert him?". I answered him: "The last thing that you must do is to say something. Take action! Live! Then, seeing your life, your witnessing, the other one will perhaps ask you why you live thus". I am convinced those who don't believe or don't seek God, maybe haven't felt the restlessness that comes from seeing a witness. And this is very tied to affluence. Restlessness is rarely found in affluence. This is why I believe that against atheism, that against closure to transcendence, prayer and witnessing are truly worthwhile. Catholics in Sweden are a small minority, and for the most part composed of immigrants of various nations of the world. You will encounter some of them celebrating Mass at Malmö on November 1st. How do you see the roll of Catholics in a culture like that of Sweden? I see a healthy coexistence where each one can live their faith and express their witnessing living an open and ecumenical spirit. You cannot be Catholic and sectarian. We must strive to be together with others. "Catholic" and "sectarian" are two words in contradiction. This is why at the beginning I wasn't planning to celebrate a Mass for the Catholics on this trip. I wanted to insist on an ecumenical witness. Then I reflected well on my role as pastor of a flock of Catholics who will also come from other countries, like Norway and Denmark. So, responding to the fervent request of the Catholic community, I decided to celebrate a Mass, lengthening the trip by a day. In fact, I didn't want the Mass celebrated on the same day and in the same place as the ecumenical encounter to avoid confusing plans. The ecumenical encounter is preserved in its profound significance according to a spirit of unity, that is my desire. This has created organizational issues, I know, because I will be in Sweden for All Saints Day, which is important here in Rome. But in order to avoid misunderstanding, I wanted it to be so. You are a Jesuit. Since 1879, the Jesuits have carried out their activities in Sweden with parishes, the Spiritual Exercises, the journal "Signum", and in the last 15 years, the Graduate Institute "Newman". What commitments and what values should characterize the apostolate of the Jesuits today in this country? I believe that the first task of the Jesuits in Sweden is that of favoring dialogue in every way with those who live in the secularized society and with believers: talking, sharing, understanding, standing alongside. Then clearly favoring ecumenical dialogue is necessary. The model for Swedish Jesuits must be St Peter Faber who was always in journey and who was guided by a good, open spirit. The Jesuits don't have a quiet structure. We must have restless hearts and have structure, but restless. Who is Jesus for Jorge Mario Bergoglio? Jesus for me is He who has looked at me with mercy and has saved me. My relationship with Him has always had this principle and foundation. Jesus has given meaning to my life here on earth and hope for the future life. He looked at me with mercy, he took me, he put me on the street.... And he has given me an important grace: the grace of shame. My spiritual life is all written in Chapter 16 of Ezekiel. Especially in the last verses, when the Lord reveals that he will establish his covenant with Israel saying to them: " I will re-establish my covenant with you, that you may know that I am the Lord, that you may remember and be ashamed, and never again open your mouth because of your disgrace, when I pardon you for all you have done". The shame is positive. It makes you act, but it makes you understand what your place is, preventing any pride and vainglory. What comes spontaneously for me to add now is simply: go, walk together! Don't remain closed in rigid perspectives, because in these there is no possibility of reform. The Pope, Fr. Spadaro and I have spent about an hour and a half together in conversation. At the end, Francis accompanied us to the elevator. He recommended we pray for him. The doors closed while he waved to us and with a radiant smile that I will never forget. while get into the car to return in time for supper in the community of Civiltà Cattolica.